Diabetic Retinopathy is the leading cause of vision loss for those under age 70. 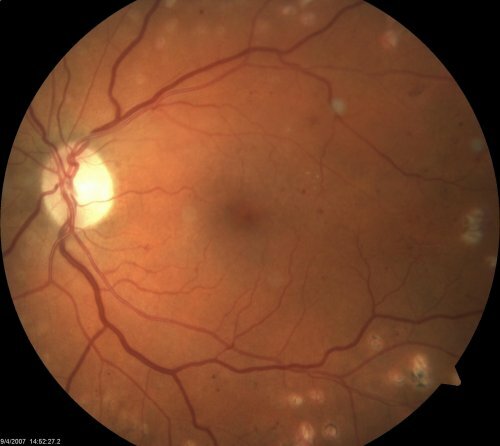 Sadly, most of the vision loss is preventable with proper Diabetic Retinopathy Screening and good long term sugar control, as measured by Hbg A1c less than 6.5. This prevents not only diabetic retinopathy, but also diabetic kidney and nerve disease as well. 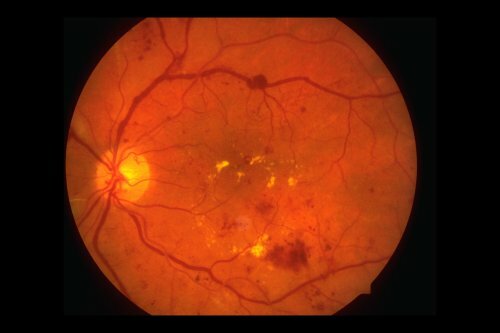 Long term good sugar control can even reverse Diabetic Retinopathy. It takes months to years of bad sugar control to get retinopathy. It can take years to reverse it. The Diabetic Retinopathy treatment at the ophthalmologist’s office can slow down vision loss or buy time for the patient to get better sugar control. But without long term great sugar control, the problem recurs. 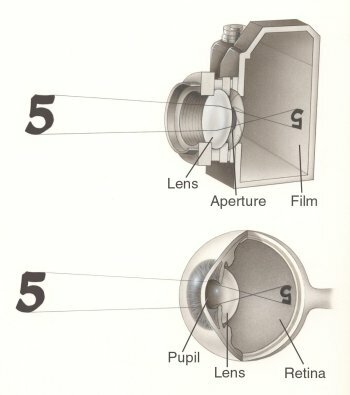 The eye is similar to a camera. 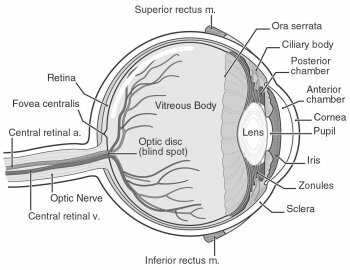 The cornea and lens focus light on the back of the eye. The film that the light focuses on is the retina. The center of the retina is a very important piece of real estate. It’s called the macula and its center called the fovea gives us our best center, color, and reading vision. The fovea is no bigger than the letter “e” in a newspaper! A normal eye is seen below. 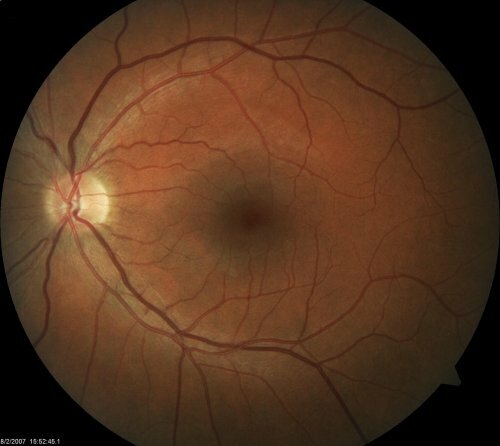 The blood vessels come out of the white colored optic nerve a curve around the back of the eye. 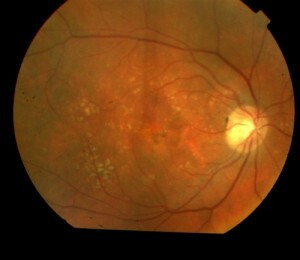 Later you can contrast the normal vessels seen here with those affected by diabetic retinopathy. n diabetic retinopathy – the “film” of the camera is affected. Long term poor sugar control damages the blood vessels in the back of the eye. At first, minor blood vessel changes occur- the blood vessel walls weaken. 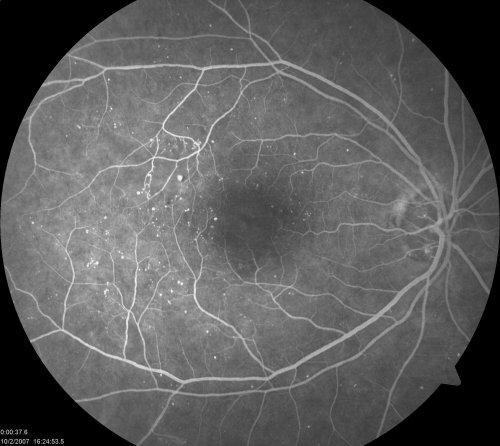 Non-proliferative or Background Diabetic Retinopathy is a sign that sugar control has not been what it should be. See the picture below and notice the small red dots (circled). Those are the damaged blood vessels. A test often done in the office is a fluorescent angiogram. This test uses a dye to help see the blood flow and any leaks. The dye used is different from contrast dye used in CT scanning or IVP dye. It has no iodine. The abnormal vessels are seen easier. The vessels develop micro-aneurysms. The abnormality is weakening of the vessel wall which causes it to “pooch” out like a thin spot on the wall of a tire. It is one of the earliest changes seen in the disease. A normal angiogram is shown below. 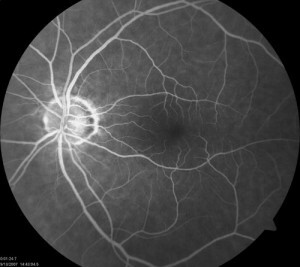 Here is an angiogram of an eye with background or non-proliferative diabetic retinopathy below. With longer term poor sugar control the blood vessels can start to leak. This is called macular edema. 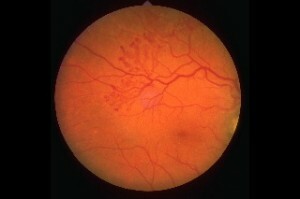 The cholesterol and fat from the blood can be seen settling in the retina (see below). There is retinal swelling. 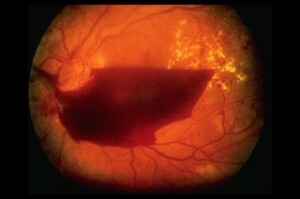 Diabetic Retinopathy treatment is done with a laser. Laser spot welds the leaks. 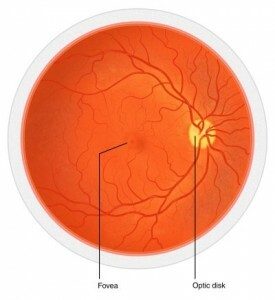 The “focal” laser lowers the rate of vision loss by 50%. With laser and better long term sugar control the vision loss rate can be reduced by 95%. Laser alone, won’t do it. It just buys the patient time to get serious about sugar control. Lately, some new therapies like Avastin or Kenalog in the eye have been shown to help. Retinal Angiography in the office can help spot the leaks. The next photo is of an eye that has had laser and fluid has dried. The small focal laser marks are seen. The doctor will avoid treating the exact center of the vision with the laser. Another kind of Diabetic Retinopathy laser treatment is done for this condition (called PRP or Pan Retinal Photocoagulation). The new vessels form because the natural blood vessels have begun to close. This starves the eye for blood and oxygen. 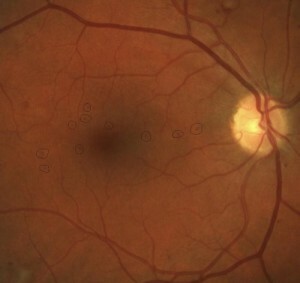 The dying but not yet dead retina tissue produces a substance known as VEGF (vascular endothelial growth factor) that induces new blood vessel growth. But the new vessels form where they shouldn’t. PRP laser treatment kills the dying tissue in the part of the eye that we don’t use for vision. Notice the white laser spots in the picture below. They are larger than focal laser spots and much further away from the center of the vision. This slows the new blood vessel growth. Avastin (a VEGF blocker) may be helpful in this disease as well and may be an alternative treatment. Avastin can be put inside the eye during an office visit. It seems to treat both macular edema and new blood vessels. The Eye Clinic of Florida has prevented vision loss by offering Diabetic Retinopathy Screening and Treatment for Zephyrhills, Pasco County, and the Greater Tampa Bay Area Since 1997. Contact us for your free screening today.